Welcome to Dallas Women’s Healthcare Specialists! Dallas Women’s Healthcare Specialists’ staff and doctors have been delivering healthcare to women in north Texas since 1992. We pride ourselves in offering comprehensive Obstetric, Gynecologic and Primary Care services in a compassionate and thorough manner. Our entire staff is committed to the provision of quality care, always considering the specific needs, concerns, and expectations of our patients. Our hospital affiliations include Baylor University Medical Center and Pine Creek Medical Center. Our office is located at 3611 Swiss Avenue. We are located at the corner of Swiss and Gordon, adjacent to Baylor University Medical Center near downtown Dallas. Free parking is located behind the building. We look forward to providing you with excellent care and the respect you deserve. We now offer The MonaLisa Touch Procedure in the office! 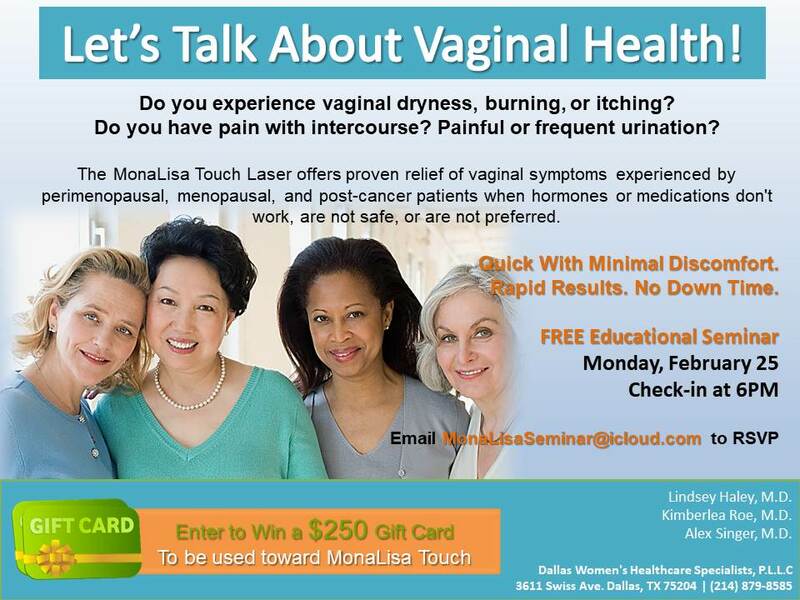 Our next FREE SEMINAR will take place Monday, February 25th at 6 pm.